I just returned from the Pennsylvania trade/public RV show and while looking at a new motorhome on a Freightliner Custom Chassis I noticed what looked to be a small fuel tank located under one of the outside storage compartment doors. The cap on the tank had the letters (DEF) which I later discovered stands for Diesel Exhaust Fluid. I had no idea what Diesel Exhaust Fluid was, so I headed over to the Freightliner display to find out. The Freightliner representative was extremely knowledgeable and helpful in explaining what DEF was, and after returning home I decided to research it a bit further. It turns out DEF was a result from the latest rounds of EPA mandates on diesel engine emissions standards. These EPA mandates on diesel emissions have a long history. For over 25 years the EPA has aggressively increased stringent diesel exhaust emissions standards on manufacturers, most notably in the areas of Particulate Matter (PM) and oxides of nitrogen (NOx). These exhaust emissions are by-products of the combustion (or incomplete combustion) of diesel fuel. Think of the PM as the soot or smoke you see emitted from the exhaust system. Oxides of nitrogen result from a bad reaction between nitrogen and oxygen in the high temperatures created by the combustion process. In 2000 the EPA signed emissions standards aimed at PM emissions, designed to take full effect by the release of 2007 model year vehicles. That brings us back to DEF and the 2010 EPA mandates, designed to reduce the amounts of nitrous oxide emissions released into the atmosphere. As far as the RV Industry goes all but one Original Equipment Manufacturer (OEM) chose a process called Selective Catalytic Reduction or (SCR) to meet this new EPA standard. Simply put SCR adds a Diesel Exhaust Fluid into the exhaust gas and filters it trough a catalyst to convet NOx into nitrogen and water. 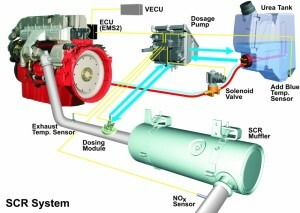 This system is designed to remove additional PM and emissions from the diesel combustion process. So what does all of this mean to the new diesel RV owner? 1) SCR gives you 5% to 8% better fuel economy. 2) More torque & horsepower compared to a similar 2007 engine with Exhaust Gas Recirculation (EGR) technology. 1) The owner will need to keep the DEF tank topped off, but this won’t be hard to do since DEF will be abundantly available at travel centers & auto parts stores. 2) It is possible for the DEF solution, made up of two-thirds part water, to freeze, but the DEF tank is insulated and the system uses heated lines to deliver the fluid to help avoid freezing during start up and normal operation. 3) DEF can degrade, but it would take 125 degrees of direct heat over a fairly long period of time, which is unlikely to ever happen. 4) If for any reason you do not refill the DEF tank and you run out the engine will decrease speed to approximately 30 mph until more DEF is added to the system again. There are gauges in the coach that will alert you in plenty of time to refill the tank before it runs dry. 5) Increased cost. As with all new technology the pricing will be affected, but the jury is out on whether the projected increased fuel economy will offset the increase in price over a period of time. So like it or not, this is the system of choice being used by the majority of RV manufacturer’s to meet or exceed the 2010 EPA diesel emissions standards. Get ready for the next round of EPA mandates. Now that the exhaust coming out of the tailpipe is probably cleaner than what is going into the intake (in many areas of the country) we need to brace ourselves for what is next. It looks like the next government approved EPA and DOT mandates are aimed at increased fuel economy and Greenhouse Gas (GHG) emissions. These new diesel emissions standards will be phased in between 2014 and 2018. The new standards being imposed are sure to dramatically increase the cost of a diesel powered motorhome again, and the question begs will the ends justify the means? I guess we’ll have to wait and see.